The meeting leader is the employee who is responsible for planning, organizing, managing the details about, and inviting the participants to a meeting. They are the employee who is in charge of and responsible for the progress of the actual meeting. They take action before, during, and after the meeting to ensure that the meeting reaches its goals successfully. The meeting leader is key in making meetings and teams successful. The employee who serves as the meeting leader is critically important. In some meetings, the leader is the department head, the team leader, or the person appointed by senior management to lead an initiative. These employees were selected for their leadership role because of their perceived skills as a manager or leader. Other times, an employee may emerge as the leader naturally. These leaders are employees that other employees look up to and respect. On other occasions, a team may decide to rotate the leadership role among all members. This allows all team members to continue to develop their skills as meeting leaders, and in creating successful meetings, in general. Following are the key responsibilities of a meeting leader. Determines the goal, task, or purpose that must be accomplished. This is often an assignment or part of the leader’s job description. Decides whether a meeting is the best possible method for obtaining the goal or purpose or attaining the desired outcome. Answer the question: is a meeting needed? Determines who needs to help plan the meeting. Determines the date, time, and location most frequently using a shared organizational calendar. Puts together meeting pre-work such as reading, financial information, history, related team meeting minutes, and so forth. Ensures that the meeting has a recorder or minute taker to document the proceedings and any commitments, action items, or decisions. Appoints a timekeeper, when necessary for the orderly conduct of a meeting. May use an icebreaker to warm up the participants and create an environment in which the meeting participants are comfortable communicating with each other and exchanging ideas and information. Spices up the company meeting so that participants don't feel dull and bored. Whether using icebreakers, humor, or fun examples, no meeting should end without a laugh. Ensures that the next steps and action items are assigned and handled. Debriefs the meeting and plans the agenda for the next meeting. Follow up with participants between meetings to make sure that action items are on track and to offer assistance and/or resources if the volunteer is experiencing problems. The meeting leader takes on these responsibilities but also has roles related to communication, reporting, and teammate performance. Every member of a team or meeting that is cross-functional has an obligation to keep his or her department or function informed about the activities and progress of a meeting or an ongoing team. They also have the responsibility to seek input from coworkers who are not on the team or in the meeting. Not every employee can attend every meeting. The leader has the additional responsibility of keeping senior managers involved and informed through effective communication and feedback. Building ownership from employees outside of the team or meeting, especially organization leaders, ensures that the team or meeting is successful at developing, implementing and integrating its solutions or ideas. 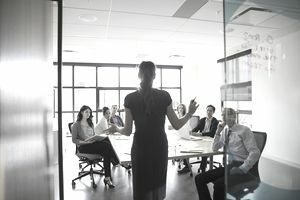 If a meeting participant is performing ineffectively in the meeting, the leader has the responsibility to correct the behavior through effective meeting leader techniques during the meeting and effective coaching outside of the meeting. A meeting participant who monopolizes the meeting with his or her opinions or criticizes other members for theirs must be corrected before the individual sabotages the meeting’s success. These actions are necessary until meeting participants reach a level of comfort and maturity that allows them to assist the leader by chiming in themselves as ineffective events unfold and dysfunctional members interrupt progress. An effective meeting leader doesn’t guarantee that a project or team performs successfully, but he or she is a key contributing factor when projects, departments, meetings or teams succeed. Meeting minutes are an effective contributor to successful meetings when minutes are appropriately written and distributed in a timely manner.